“First, I want to thank God for being alive,” were the first words President-elect Jair Bolsonaro of Brazil said at an Evangelical Christian service on Tuesday night, his first public appearance since winning Sunday’s election. Bolsonaro delivered a victory speech online on Sunday but has spent most of the time following that engaged in meetings to assemble a cabinet. His public appearances now require heightened security after a socialist fanatic attempted to assassinate him at a campaign rally in September, stabbing him in the abdomen and causing enough damage to require reconstructive surgery for his digestive tract. Bolsonaro called his survival a “miracle” and began his remarks at the Assembly of God – Victory in Christ church in Rio de Janeiro by simply expressing gratitude for his life. Bolsonaro has a long history with the church and Pastor Silas Malafaia, who noted in his remarks introducing the president-elect that he had officiated Bolsonaro’s marriage to soon-to-be First Lady Michelle Bolsonaro, his third wife. Bolsonaro also admitted that he “cried a lot” following the election reflecting on the depth of the challenges Brazil was facing and how to fix them. He also promised the audience that his supporters had elected “a person committed to the values of the Christian family,” to applause. Bolsonaro was once a longshot to take over the Brazilian presidency, but rapidly rose to prominence in light of the growing scandal known as “Operation Car Wash.” Police in southern Curitiba, enabled by crusading judge Sergio Moro, began unveiling a large-scale corruption scheme in 2016 in which politicians of all major political parties were trading lucrative government contracts for bribes. Private contractors like the disgraced firm Odebrecht would promise to kick back bribes to politicians in exchange for preventing fair bidding on infrastructure projects and paying the firm far more than the work cost, a scheme that amounted to millions of dollars in taxpayers’ funds stolen. Bolsonaro, with no alliances on the political left and a part of the small, conservative Social Liberal Party (PSL), had no history of corruption and campaigned on a promise to arrest and convict all those involved in the scheme. On Monday, Bolsonaro said in an interview he hoped to appoint Moro, who has become a folk hero among anti-socialist Brazilians, as Minister of Justice or Supreme Court justice. 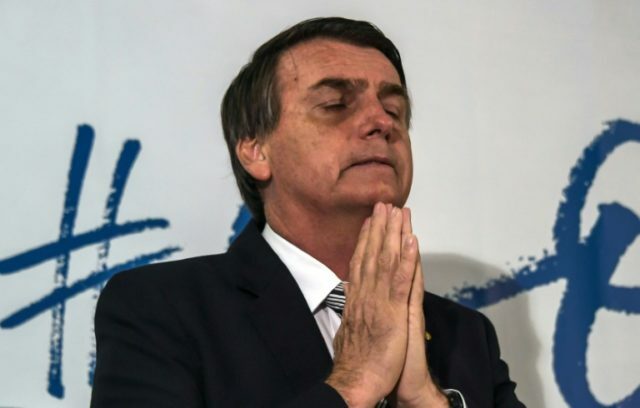 Bolsonaro also campaigned on a conservative Christian platform, emphasizing his faith but noting that, as an Evangelical, he had married a Catholic and considered the promotion of Christian values more important than disagreements among denominations. Pastor Malafaia, speaking during the event Tuesday, made similar remarks, emphasizing that Bolsonaro was elected by Evangelicals, Catholics, and believers in other religions. Malafaia also emphasized that the Christians who voted for Bolsonaro were seeking a secular government, not a theocracy. “I wanted to make that clear and reaffirm that the state is secular. And it has to be,” Malafaia affirmed, adding that being secular does not necessarily mean being “against religion,” but merely neutral to all religions. Bolsonaro will take office on January 1.